Acquiring new clients is expensive. Depending on the study, research shows that the cost to acquire a new client is anywhere from five to 25 times the cost to retain an existing client. Yet many law firms focus the majority of their marketing efforts on client acquisition — not client retention. Here’s more research if you’re not convinced of the value of client retention: Frederick Reichheld of Bain & Company (the inventor of the net promoter score) found that increasing customer retention rates by 5 percent increases profits by 25 to 95 percent. From client alerts to blog posts, webinars, educational events and more, law firms are investing heavily to demonstrate their attorneys’ expertise and attract the right clients. How can these efforts be leveraged to enhance the client experience? Marketing automation is software that automates various marketing tasks, such as email, social media, lead generation and more. In a relationship-driven industry like the law, “automating” communication with clients can seem counterintuitive. 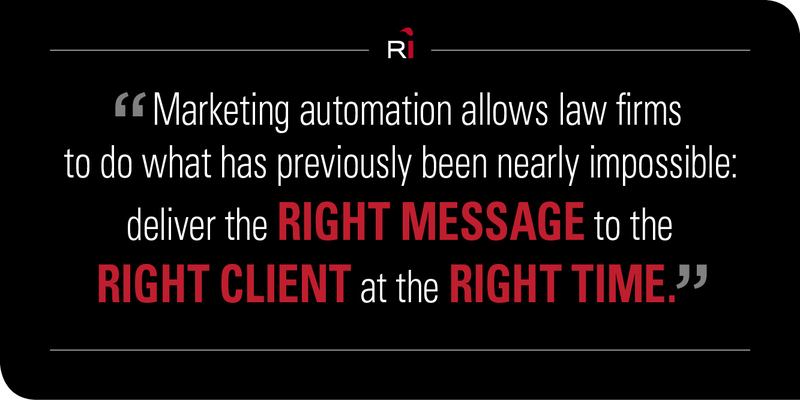 However, marketing automation allows law firms to do what has previously been nearly impossible: deliver the right message to the right client at the right time. It also unveils valuable data with rich insights into your clients’ needs and behaviors. Providers include SharpSpring, ActOn, HubSpot, Eloqua, Pardot and Marketo. The first three are good options for small to midsize firms, and will cost, on average, between $600 and $1,200 per month. The last three are more suited to large law firms and will cost between $2,000 and $4,000 per month. So how can law firms use marketing automation to develop deeper relationships with clients, turn them into brand advocates (that’s marketing-speak for referral sources) and, over time, generate more business with them? Often, the earliest stages of a client relationship are the most important. Clients quickly form impressions that are hard to change, so it’s critical to ensure the earliest communications your new clients receive are personalized, relevant and helpful to them. Your first task is to map out the steps that clients go through when they first begin working with your firm. From signing the contract, to scheduling input meetings, to billing, these can all be mapped out into workflows, which you can then automate to ensure consistency in your communications. Amazon is the king of cross-selling. By tracking your site behavior — what you view and purchase — Amazon then suggests other products you might be interested in. Amazon has gotten so good at this, and we’ve become so used to it, that the phrase “the Amazon effect” is often used to describe the heightened consumer expectations that Amazon has created. Tailored, valuable product information is served up when and where we need it. 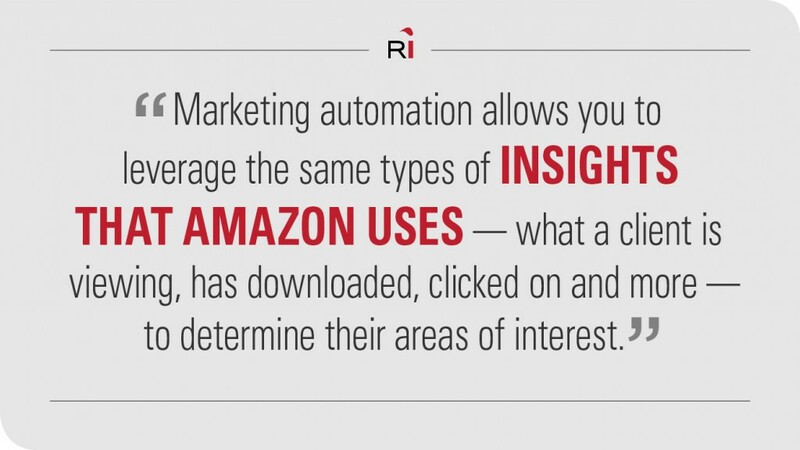 In professional services like the law, marketing automation allows you to leverage the same types of insights that Amazon uses — what a client is viewing, has downloaded, clicked on and more — to determine their areas of interest. For example, if your firm creates an informational report, and a client who is not currently using your law firm for that service area downloads it, you can build an automation campaign that addresses similar topics and how your firm can help in similar situations. You can also set up rules to notify the right lawyer to reach out to that client to discuss the topic. With marketing automation, you can also identify high-traffic landing pages and conversion points (your website hotspots) and then develop supporting content to further engage interested readers. Using workflows, if a client views a certain topic area a given number of times (defined by you), you can then use email marketing, social media, tailored calls to action (CTAs) and other tools to deliver more and more content on that topic, guiding and nurturing the client to engage your firm for that service. As we all know, general counsel and C-suite executives don’t have time for content that’s not relevant to them. Thankfully, this is where marketing automation shines. Determine optimal marketing patterns for various segments — for example, clients in one industry may respond better to certain subject lines, content formats, etc. When you know what topics clients are interested in, as well as how and when they want to receive the information, the sky’s the limit. How can you use technology to get to know your clients better? 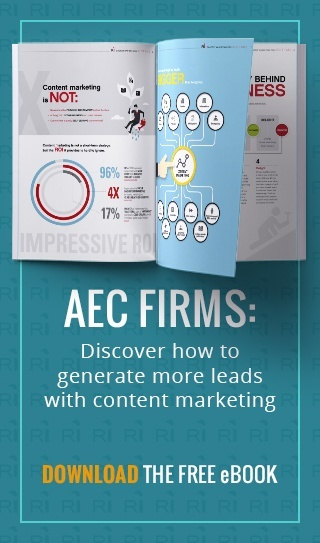 The key is to combine content — blog posts, email alerts, research reports, webinars and more — with marketing automation, and then analyze what your clients engage with and how. Data such as pages viewed, number of times a page is viewed, content downloads, opens, clicks, social media interactions and more can tell you what is on a client’s mind. Another personal favorite feature of mine: progressive profiling. Most marketing automation systems feature this functionality, which uses smart lead forms to build more in-depth knowledge of your client. Instead of asking clients to fill out their name and email every time they want to access a piece of content, progressive profiling recognizes the client and asks for more information each time. For example, if you already have the client’s name, email address and job title, you can ask questions such as what their most pressing legal concerns are, whether they have any strategic changes on the horizon, how they prefer to be communicated with and more. In addition, by controlling the length of the form, you’ll increase your conversion rates. No one likes filling out long forms. We’ve all heard of the Pareto Principle, or the 80/20 rule — the idea that 80 percent of your results comes from 20 percent of your effort. This generally means that for most firms, a small handful of repeat clients account for most of the firm’s income. It also means that generating new clients from scratch is much less profitable than maximizing referrals from your best clients. How can marketing automation help you increase referrals? It’s all in the data. By identifying who views, downloads and shares your content the most, you can deepen relationships with those clients, stay top of mind with them and increase the chances they’ll refer you when they have the chance. You get the picture. Overly demanding, difficult clients should not be included. Once done, you can more effectively focus your efforts on securing referrals. As marketers, we know that consistency is important. As clients have become increasingly digital savvy, consistency has risen in importance. According to 2017 research from Forrester, 95 percent of clients use three or more channels to connect with a company in a single service interaction, with 62 percent using more than one device. In addition, research by Accenture found that 65 percent of clients expressed frustration over inconsistent experiences or information across multiple channels. Marketing automation integrates your marketing channels. Instead of having disparate systems and approaches, you can operate the firm’s blogs, social media platforms, email, landing pages and more from one platform. Your terminology, brand personality, visual identity, timing, approaches and messages can all be applied uniformly, no matter the medium. 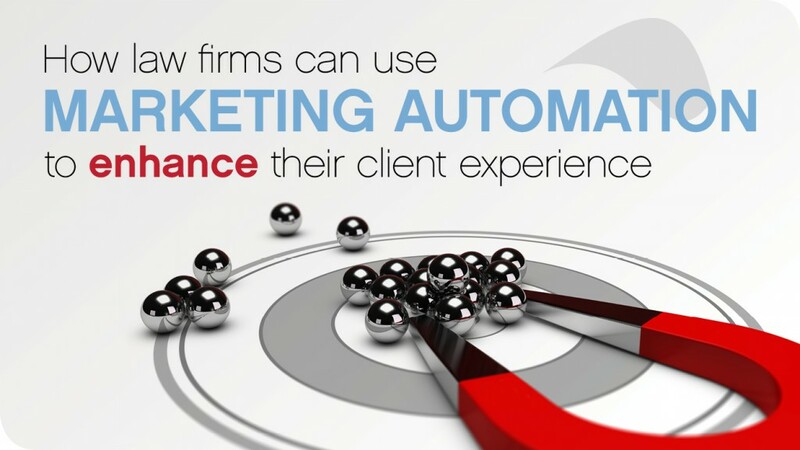 There you have it — six proven ways marketing automation can enhance your law firm’s client experience. Marketing automation isn’t easy. It takes a lot of time and strategic thinking to do it right. But the benefits far outweigh the effort involved. If you’d like help implementing a marketing automation strategy for your firm, contact me at michelle@rep-ink.com or 904-374-5733. Michelle Calcote King is an award-winning marketer with nearly 20 years of expertise in all things marketing, content, media and public relations. Specializing in highly complex industries, she leverages superior writing skills, media savvy and a love of all things digital to move her clients’ businesses forward. Read my full bio or connect with me on LinkedIn.